China Agrees To Pollution Limits, But Will It Make A Difference? 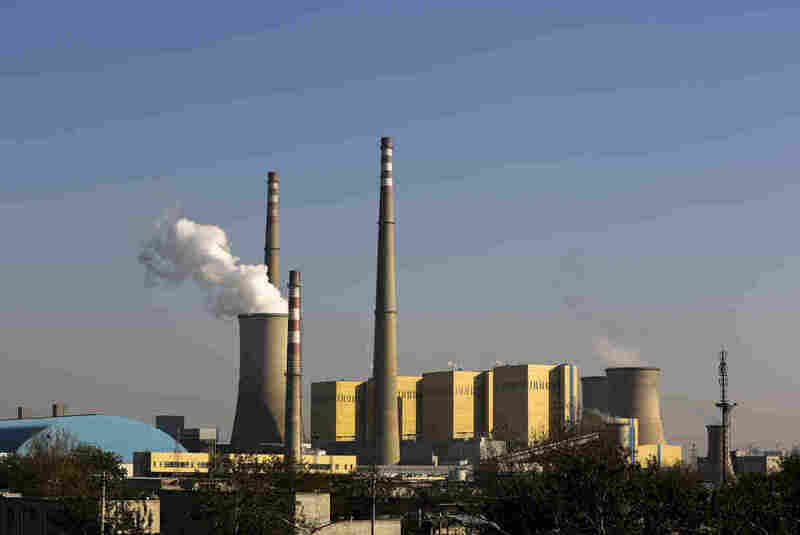 : Parallels China has for the first time announced a ceiling to its future carbon emissions. Critics say the commitment is primarily symbolic, and unlikely to have a significant impact in the near future. China Agrees To Pollution Limits, But Will It Make A Difference? 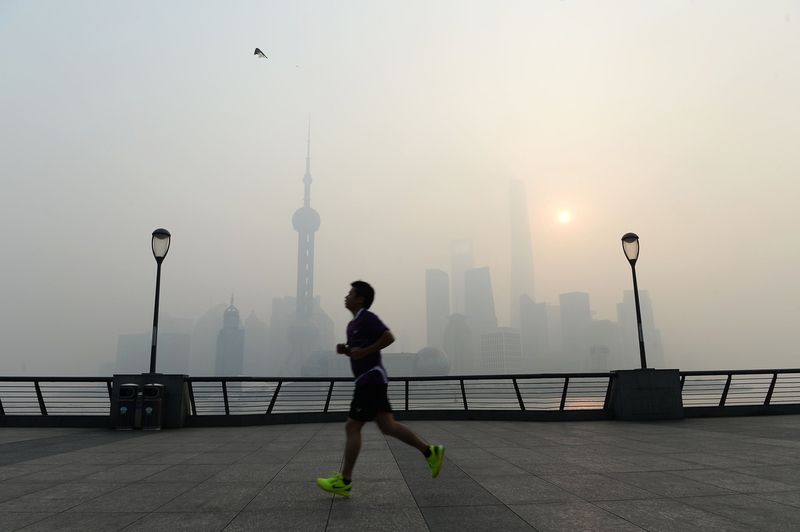 A jogger goes for a run amid heavy smog in Shanghai on Wednesday. China has for the first time agreed to limit its carbon emissions, but critics are questioning whether the move goes far enough. All this week, Beijing residents have had a breath of fresh air. With world leaders in town for a summit meeting, China shut down factories, took many cars off the roads and declared a week-long vacation for many Beijing residents. If only the skies were always this blue, some residents thought. But of course no quick fix will solve the problem. China promised for the first time that its emissions will continue to climb until peaking around the year 2030. Greenpeace climate and energy campaigner Li Shuo says that with this timeframe, China has left itself plenty of leeway. He says China can and should hit peak emissions well before 2030. "The two sides sent a politically important message, which was to announce climate goals for the post-2020 period as early as possible, he said. "With that as a basis, we think they can take stronger action." But what's more important than when they peak, he adds, is at what level of emissions they peak. He says China is expected to release that target next March. One good way to keep that number low, he suggests, would be to impose a cap on coal consumption, which is both China's largest source of energy, and of pollution, especially the particulate matter known as PM2.5, which is bad for people's lungs. "If we don't conscientiously examine our reliance on coal," Li says, "we will have no way to control the progression of climate change." Smoke billows from a coal-fired power plant in Beijing on Thursday. For an international summit earlier this week, China temporarily closed factories and the skies were less polluted for a couple days. Meanwhile, China aims to get 20 percent of its energy from nuclear, solar, wind, hydropower and other non-fossil fuels by 2030. He says that 20 percent target is nearly as much as all of China's power generating capacity now. "This means that in the next 15 years," he explains, "China will have to build the energy equivalent of another China, but one that is entirely based on non-fossil fuels. This sends a signal that China has begun to say goodbye to coal." Indeed, Li notes that for the first time in this century, shifts in China's economy caused coal consumption to actually decline in the first three quarters of this year. China has been trying for a decade to switch to a less-polluting mode of economic growth. Right now, local officials get promoted for increasing GDP, often through energy-intensive infrastructure projects, not for protecting the environment. In January, a revised environmental protection law will come into effect that should change that. "For the first time, they enshrine in law the idea that the performance of provincial and local officials is going to be rated highly on how well they achieve these environmental targets," says Barbara Finamore, Asia director of the Natural Resources Defense Council.. The problem, though, is that China's poorer regions have not met the material needs of many citizens. In those areas, GDP growth still trumps environmental protection. Experts point out that China's government has been spurred to action not so much by the threat of climate change, but by domestic anger at pollution, and the international damage to China's reputation. During this week's summit, some air quality data in China was reportedly censored. Greenpeace's Li Shuo notes that officials may miss emission reduction targets. And they may be able to fudge environmental statistics. But they can't fake a blue sky. In the audio of this story, as in a previous Web version, we incorrectly identify a source as Georgetown Univeristy professor Joanna Lewis. It was in fact Barbara Finamore, Asia director of the Natural Resources Defense Council.